A Call-Back Profile is a collection of settings and configurations that define parameters for the calls that Fonolo receives and places for you. 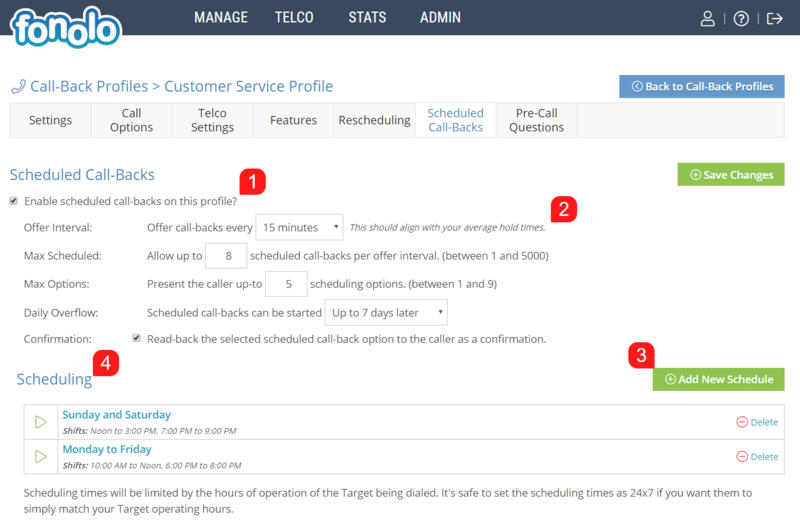 To configure a newly created or existing Call-Back Profile, go to MANAGE (1) > Call-Back Profiles (2). Scheduled Call-Backs is an optional feature that allows clients to schedule a call-back by an Agent for a time frame that they prefer, instead of being called by the next available Agent. To turn on Scheduled Call-backs, check the box that says ‘Enable scheduled call-backs on this profile’ (1) then configure the below options. Offer Interval – The offer interval will dictate the time interval for each call-back schedule option that is presented to the client. For example, if set to 30 minutes, the Client will be presented with a number of options that give 30 minute windows for when their call-back will be made to them. Max Scheduled – Here you can dictate how many call-backs can be scheduled within each specific time frame. 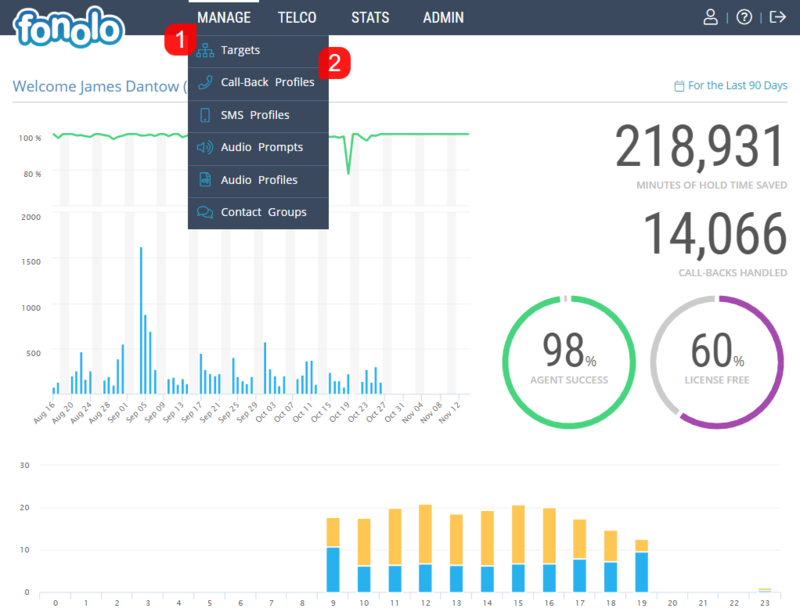 This will prevent too many Clients from selecting a specific call-back window and causing a spike in call volume. Max Options – Here you can control the number of different time windows that will be presented to the Client when they are choosing when they would like to receive a call-back. Daily Overflow – Daily Overflow dictates how far into the future that a Client and receive a scheduled a call-back. Confirmation – Select whether or not a confirmation prompt will play back to the Client about which day and time they selected to receive their call-back. Scheduling allows you to set specified time-frames on different week days within which Clients will be given an option to schedule call-backs. Clicking ‘Add New Schedule’ (3) brings up the following menu, while at the bottom of the screen you can see any currently configured call-back schedules (4). When adding a new schedule, you will be prompted with the following pop-up. First, select which days of the week that the schedule will take place on (1). Next, move the sliders left and right so that the area between them represents the time on the selected days that you would like call-backs to be offered within, called a ‘shift’ (2). 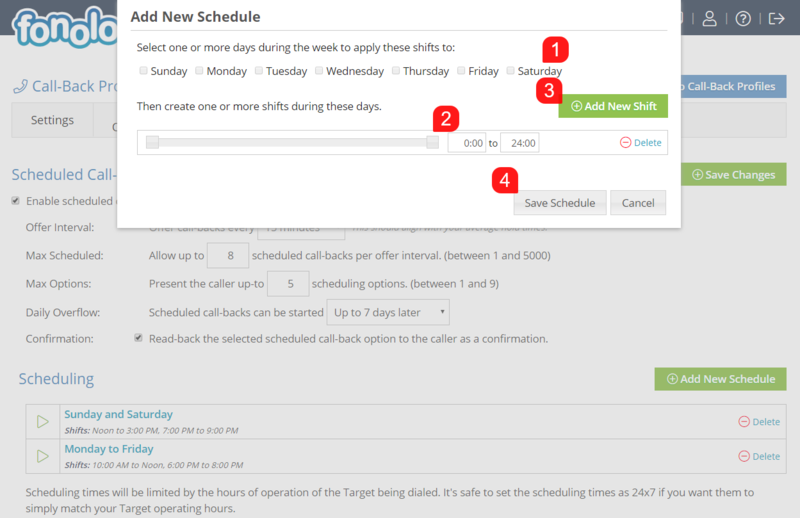 To add additional shifts, click the green ‘Add New Shift’ button (3) to add additional times within the selected days that call-backs will be offered on. Once finished, click ‘Save Schedule’ (4) to complete the process.